When we shopped for a 2004 Nissan 350Z roadster (350ZR) at the launch of the model year, we found ourselves in an information vacuum. 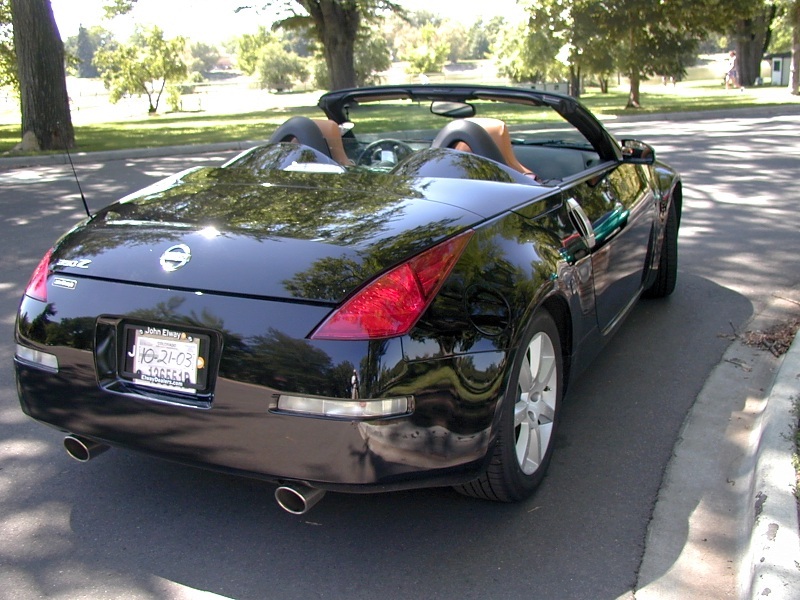 Details on 2004 Zs were in short supply in August, 2003, and the long-awaited roadsters, new for 2004, were still a mystery wrapped in enigma. Most of what we knew (or thought we knew) when we finally bought our roadster came from a fresh-off-the-truck once-over, a short test drive in a late-2003 coupe, information published on ^Nissan's official 350Z site, and from first-hand 2003 coupe intelligence gleaned from the excellent member forums at ^350ZMotoring.com and ^350ZFrenzy.com. 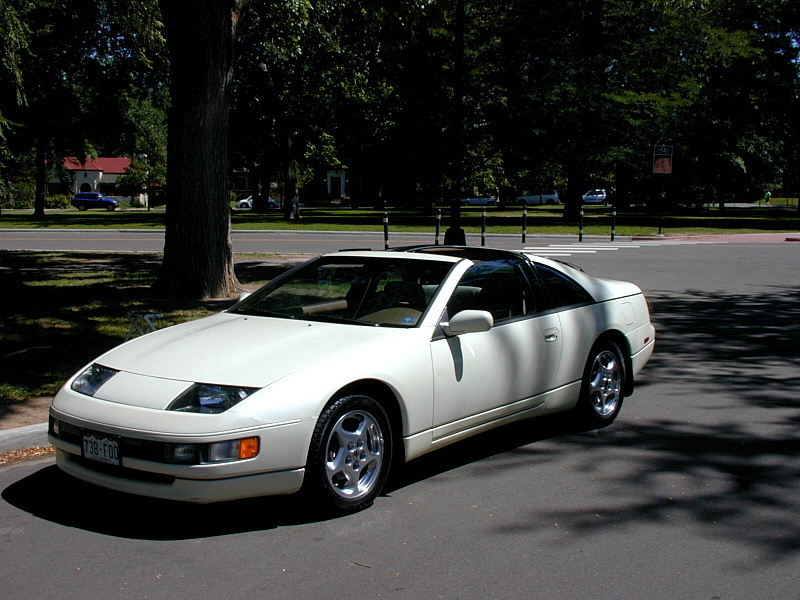 This non-commercial user-to-user (U2U) online resource is humbly offered to help flesh-out the information void faced by current and prospective 350ZR owners. All the photos, observations and opinions are my own, but I think you'll find that I've done my homework on the factual material. I've received no inducements or considerations for any of the products mentioned here; nor do I have a stake in them. I just call 'em like I see 'em. Aside from my own wallet, user-to-user donations are this site's only source of funding. If you find 350ZR» useful, please consider a donation of US$2.00, or any amount you deem fit over US$0.30, to help defray our hosting costs. Thanks for stopping by, and happy Zing! Last revised on 06/04/2005 at 21 months and 15,400 miles from purchase. 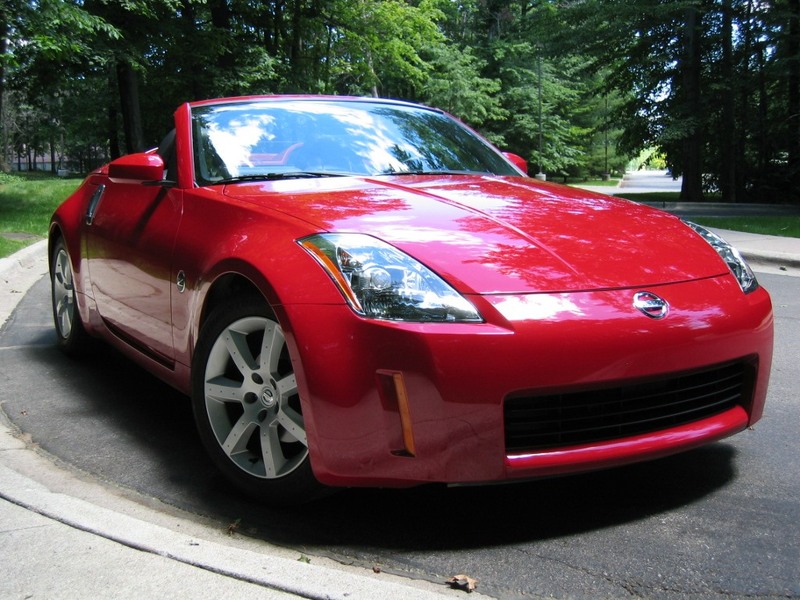 New for 2004, the ^Nissan 350Z roadster added the joy of open-air touring to the 350Z coupe, an award-winning marque with the performance and mechanicals of a sports car commanding twice the price. The result was and is an affordable performance roadster fun to drive at any speed. Naturally, something has to give in such an equation, and Nissan once again wisely chose to make most of the conspicuous sacrifices in the cabin. The rather Spartan interior remains tasteful, comfortable and highly functional from a driver's standpoint but offers little glitz. No matter — the cabin's forgotten with a nudge of the accelerator or a confident jump into a favorite turn. The musical rise of the exhaust note, the gentle stir of the cockpit air, the steady show of torque by the muscular 3.5L V-6, the car's firm grip on both road and driver, the gratifying short-throw snicks through the 6-speed gearbox — these are all the accompaniments needed give the 350ZR experience a proper framing. Creative manufacturing strategies are reported to have yielded additional Z economies. For example, moving the glove box behind the passenger seat simplified the assembly line by reducing parts bin differences for left- and right-hand drive versions. Personally, I'd rather have the glove box in the usual place, but in its current location, it's become big enough to lock away a brief case. If that's the kind of trade-off required to achieve the 350Z's enviable performance/cost ratio, I'm all for it. This first-things-first philosophy has guided the evolution of the Z line since the original, market-shattering Datsun 240Z. After a 5-year hiatus, the latest reincarnation of the legendary Z-car— the widely acclaimed 350Z featured here— gives the concept its most refined and exhilarating expression to date. The Welch explorer Llewellyn Thomas once remarked that "adventure is inconvenience properly perceived." In the grand scheme of things, the 350Z roadster's inconveniences are small, but it manages to deliver adventure to burn all the same. The automotive press has lavished praise on the 350Z like no other Z before it. Road & Track editor Mike Monticello didn't mince words when he said in the November, 2003 issue, "In case you've been hiding under a rock with the salamanders lately, there is this new sports car from Nissan that is proving to one of the best of all time. Period." This from a magazine that spends much of its time covering Ferraris, Lamborghinis, Lotuses, Porches and Corvettes. For weeks, we'd been on the fence — the gorgeous and highly capable ^Infiniti G35 Sport Coupe 6MT had recently caught my eye, but the better ventilated and more athletic 350Z roadster had just hit the dealerships. For once, I was the one talking practicality and lower cost, which in this case happened to favor the G35. But Kathy kept pointing me back to the pure joy of open-air motoring. Once you're addicted, the top-down experience is hard to give up for any coupe — even for a G35 with a generous sunroof. Either way, we were resigned to the fact that we'd have to order one of these rare catches to meet our specs, which first and foremost called for a manual transmission, a hard-to-find G35 option. We were still decidedly undecided when the ^Nissan dealer who'd been helping us fantasize about the roadster called with a excited heads-up one Saturday morning in August, 2003: An unexpected and, miracle of miracles, unclaimed black touring roadster had just rolled off the delivery truck. We rushed over for a look before it disappeared, just to say that we'd seen a roadster in the flesh before ordering one. (From our test drive of a 350Z coupe, we knew that the mechanicals wouldn't disappoint.) On the way down, we reminded ourselves of all the fuss and bother it took to keep previously owned black cars presentable. Never again, we said. Never, that is, until we saw the car. One look was all it took — the fluid black body, the simple but elegant black interior, the confident burnt orange seat accents, the ventilated seat backs, the exhaust note and the promise of nothing but sky overhead on 18 seconds' notice. Having more or less settled on silverstone or Pikes Peak white, we would never have thought to order the color scheme in front of us now, but there it was, and no one on the lot could take their eyes off it, Kathy and I included. Having beaten all other roadster seekers to the scene, we snapped it up. And suffered not even a nanosecond of buyer's remorse thereafter. We parted friends with each and every one of them — especially the 1990 T-top pictured above. From our perspective, the Z philosophy still works, and the Z-cars themselves just keep getting better and better. The 350Z is at once the most capable and refined Z-car we've driven and the most true to the spirit of the original 240Z. (Data point: A single-owner 1971 240Z still passes most of the newer models on Z club track days.) The venerable twin-turbo Z32s might be able to outrun it on a long straight, but they can't out-corner it, and they certainly can't outclass it. Family, work and driving my own 2004 350ZR leave no time for tracking subsequent model changes, and I've made no attempt to do so here. 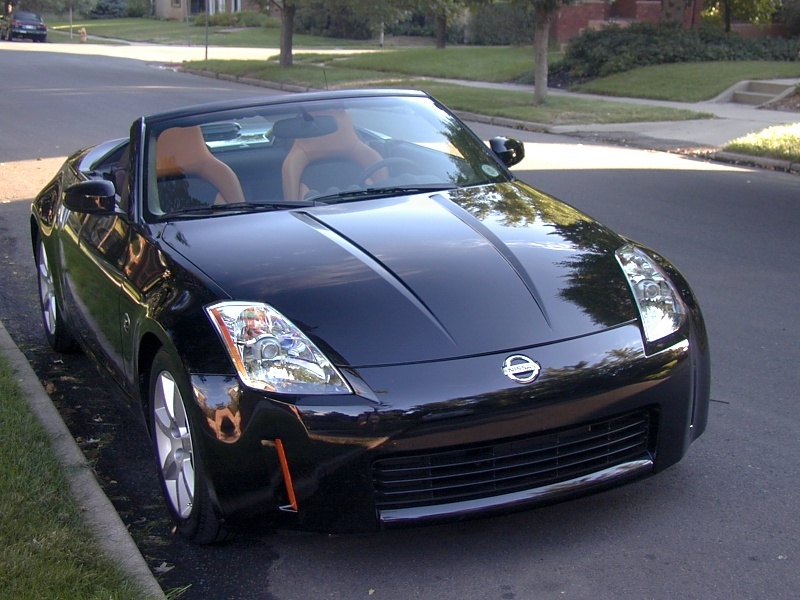 According to several sources, 2005 brought a few new options and packages and a slightly higher price to the roadster (see ^Nissan's official 350Z site for details) but no significant changes to the car itself. Specifically, the 2004 and 2005 bodies and engines are identical. The 2 roadster options I would have added — all-season tires and Brembo brakes (if not a Track version) — didn't materialize in 2005. What the future might bring is anybody's guess. Nissan always holds their cards close to their chest. As each new model year approaches, predictions and purported inside scoops flood the 350Z forums, but reliable advance information remains elusive. The dealers seem to be the last to know. I hope you find 350ZR» useful. I certainly could have used something like it when we purchased our roadster. The content here focuses on the roadster because I lack first-hand knowledge of the coupe, but much of it applies equally to both, especially for the 2004 model year. 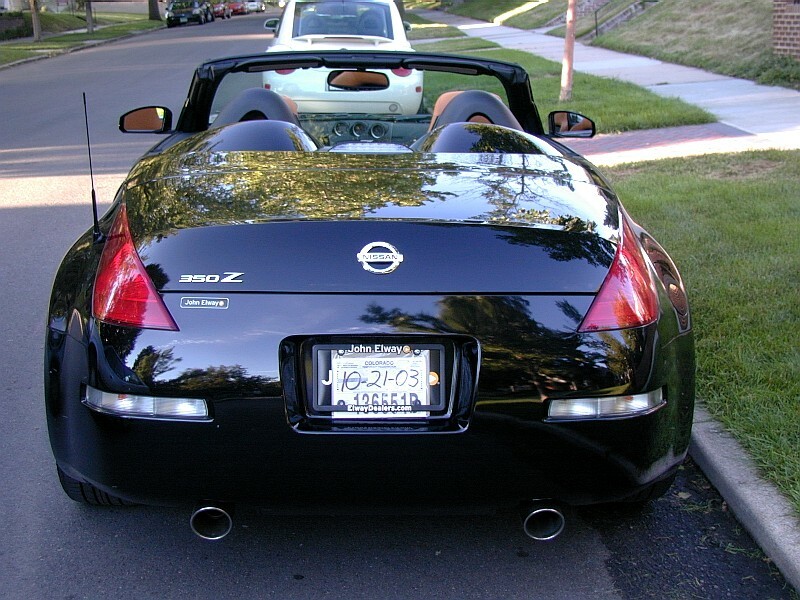 I have no desire to fuel the tiresome roadster vs. coupe debates that periodically erupt on Z-related forums. Each configuration has its pros and cons, and which appeals more is largely a matter of personal taste. In any event, the coupe and roadster are far more alike than they are different, as the Coupe and Roadster Together gallery attests. Please bear in mind that I'm a just fellow Z enthusiast with a web page editor — not an automotive expert, not a Nissan insider, not a vendor. I have no relationship with Nissan other than as a 30-year customer; nor do I have any inside line on Nissan's plans for current or future models. No inducements or considerations have been received for any of the products mentioned here; nor do I have a stake in them. That said, if you find anything controversial, incomplete, or just plain wrong, I'd love to hear about it at 350zr@cliffshade.com. I'm also willing to field e-questions on a last-resort basis at that address. If you're still empty-handed after trying the 350ZR» keyword search page and investing your own time searching the information-rich forums at ^350ZFrenzy.com and ^350ZMotoring.com and the internet's many other online Z resources, drop me a line. Naturally, my family, work and projects have first dibs on my time, but I'll try to get back to you if I think I can help. Your much-appreciated contribution will help defray 350ZR» hosting expenses. Thank you for stopping by, and happy Zing! NB: This is strictly a non-commercial site. Nothing is bought or sold here. Unsolicited commercial e-mails (UCEs) sent to any cliffshade.com address will be forwarded to the proper authorities. What do you get when you cross over 30 years of popularity with a large, avid and loyal fan-base? An internet chock-full of Z-related material, of course. Your search engine should have no trouble finding the Z information you need, but I'll share a few of my favorite Z-links here. ^350ZMotoring.com, ^my350z.com and ^350ZFrenzy.com Among the many 350Z-inspired sites now on the web, these three continue to offer active, civil and well-engineered online forums with a diversity of participants. As with all internet forums, they're best read with a salt shaker close at hand. ^350Z owner's manual for 2003 An official online 350Z owner's manual would give prospective buyers a valuable and current preview of the car, but if Nissan posts one, I can't find it. The manuals linked here are in printable PDF format. Michael Fernandez kindly provided the 2004 manual. 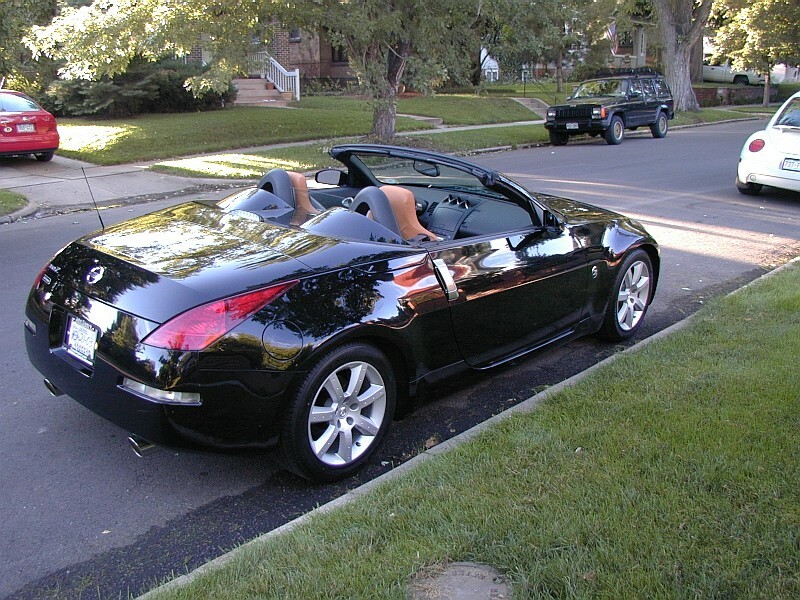 The 2003 version comes courtesy of Courtesy Nissan 350Z Parts. Sorry, all my links to the expensive 350Z service manuals have dried up. 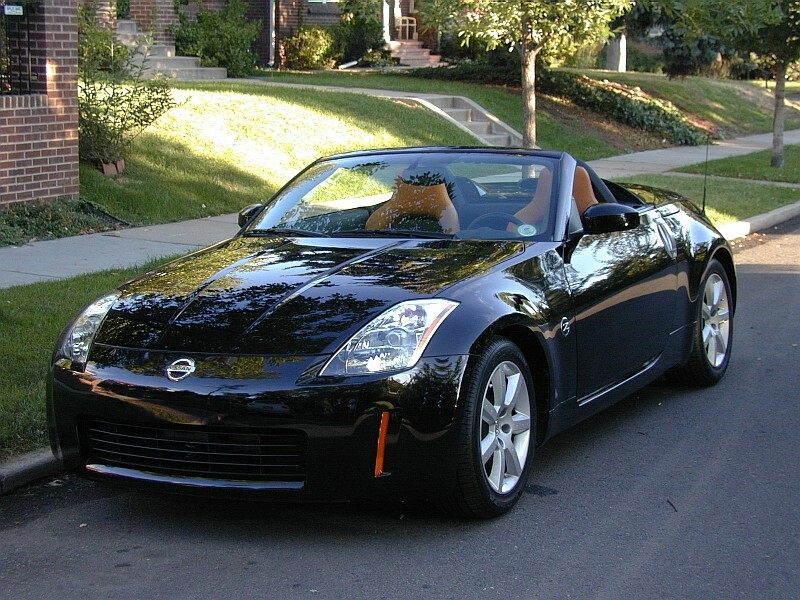 ^CanadianDriver, "First Drive: The 2004 Nissan 350Z Roadster" A very informative, well-illustrated and favorable review. ^Car and Driver, "Blow Dryers" comparo Wherein the 350Z touring roadster posts an admirable close second among the Honda S2000 (the track test winner), the BMW Z4 3.0i, the 225 bhp Audi TT turbo, and the Porsche Boxster. Note, however, that the testers felt the Honda to be suitable as a daily driver only for "extremists". ^CarWeek, "Far East Peek: Nissan makes running changes to 2004-model 350Z" This news item dated 12/01/03 appears to apply to 350Z's manufactured in October, 2003 or later. My July, 2003 roadster doesn't have the interior changes described, but October, 2003 owners have confirmed them; hard to say about the suspension changes. ^Case Logic A wide variety of automotive organizers, accessories and music cases to help you cope with the 350Z's cabin storage challenges. 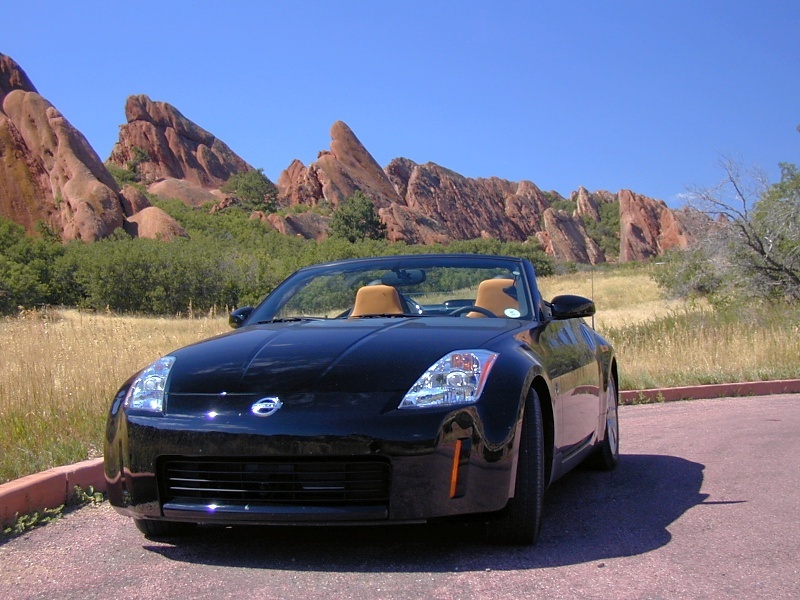 ^Courtesy Nissan 350Z Parts Genuine Nissan parts online at discount prices with friendly, helpful Texas-style service. Check prices here first before buying locally. Maybe your dealer will come down some, and maybe the sun won't rise tomorrow. Caveat: Courtesy is my favorite source for original Nissan parts and accessories that I know will work. They're very gracious about exchanges and returns, but be aware that they will charge a 15% restocking fee on all items returned for refund. ^Discount Tire Direct A large wheel and tire selection at excellent discount prices with low shipping and handling charges. Their online tire info is limited, but if you know exactly what you want, check here first. Their brick-and-mortar stores (Discount Tire) will match their online prices. ^The Family Car Web Magazine 350Z photo library With only 2 seats and no cargo space to speak of, the 350Z's a bit of a stretch as a family car, but hey, if you can sell that to your partner, go for it! The 2003 350Z coupe photo library offers superb cut-away drawings of the ^engine and the ^entire car. 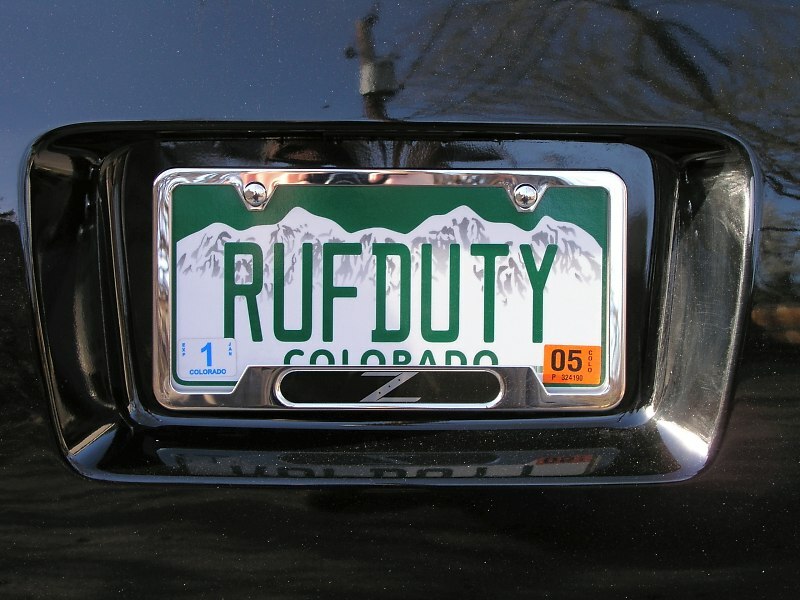 ^Griot's Garage Quality detailing supplies, thoughtful automotive accessories, and top-end garage paraphernalia— many of which I've never seen elsewhere. If you drive a roadster, a pair of their articulated "autobahn" convex mirror nicely covers those gaping top-up blind spots. Caveat: Compare their prices before buying— most items are reasonable, but some are seriously overpriced. ^Nissan's official 350Z site Building a 350Z to your specs is as good a way as any to learn what's available — and what's not. 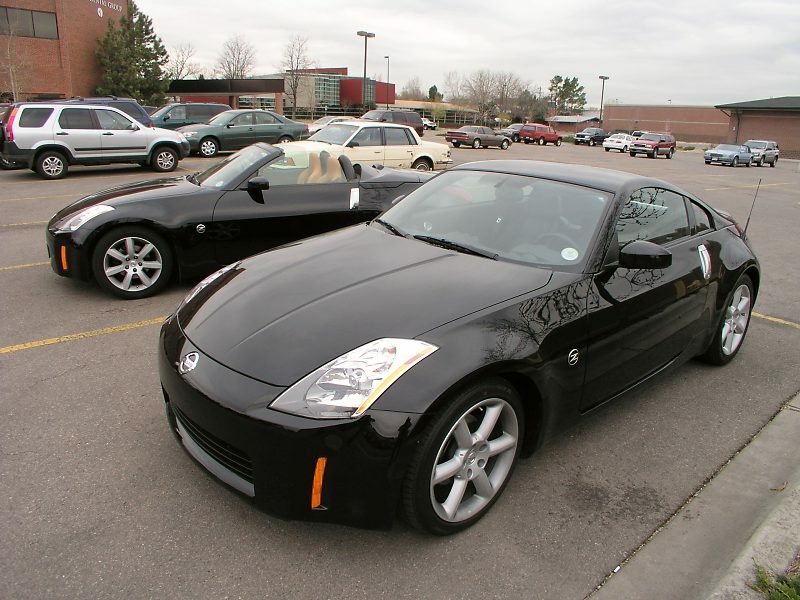 ^Paul's Z Another user-to-user 350Z site featuring photos of a late-2003 black 6MT coupe with OE 18" wheels. Paul's video clips are an absolute hoot! ^Road & Track, "David and the Goliaths" comparo Wherein the 350Z Track coupe definitively outpaces the Porsche 911 Targa and BMW M3 SMG II, while the Corvette Z06 has them all for a snack. Road & Track, "Zounds! 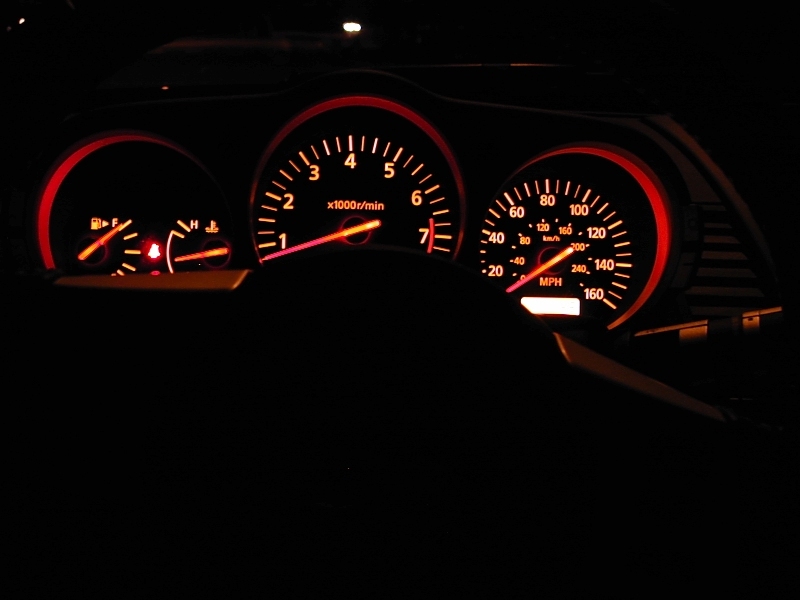 The tuners let loose on the 350Z", November, 2003 issue Wherein editor Mike Monticello says, "...there is this new sports car from Nissan that is proving to be one of the best of all time. Period." Road & Track, "Long-Term Test: 2003 Nissan 350Z Touring", November, 2003 issue After 21,542 miles, editor Mike Monticello was still able to say, "In general, we love the Z; the power, the handling— and especially the driving dynamics on twisty roads— are right up there with the world's best." ^Sport Z Magazine A must for Z fans of all vintages. The Fall, 2003 issue of this well-written quarterly dedicated to Z-cars new and old, stock and modified, featured an approving "first look" at the 350Z roadster, along with a dynamometer-verified comparo of 5 popular cat-back exhaust upgrades. ^Tire Rack Excellent prices and very helpful, detailed online info on tires of interest to 350Z owners. If you have tire fitment concerns, this is the place to check them out. Their wheel selection is limited but still worth looking over. Caveat: Keep an eye on shipping prices here. ^USA Today, "350Z Roadster: Sensational sensations" review Wherein the roadster wins James Healy's hearty approval as a performance ragtop fully worthy of the "sports car" genre and a highly sensual four-wheeled pleasuring device to boot. Of all the reviews I've read, this one gives the best sense of the car as I experience it. ^Z Car Club of Colorado A great group of people and a fabulous collection of Z-cars. 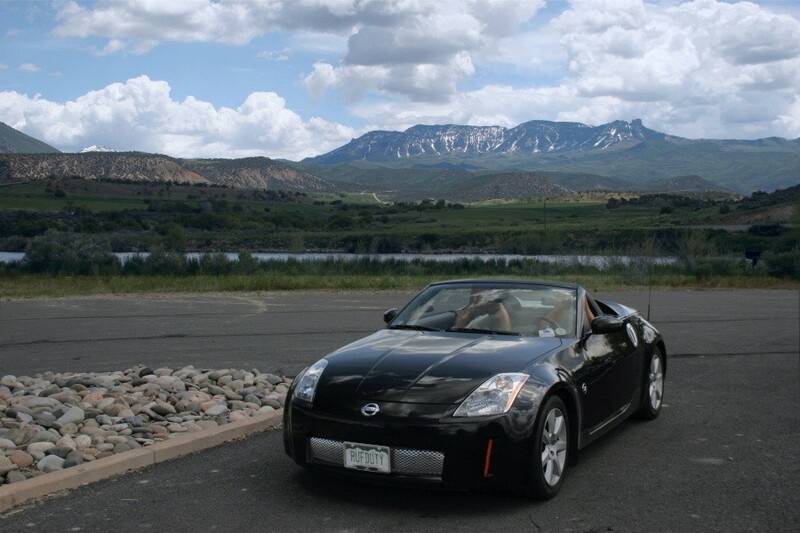 If own a Z in Colorado, especially along the Front Range, the ZCCC is worth a try. Their affordable spring and fall track days are open to members and non-members alike, and all cars are welcome. ^Z Wall A nostalgic look at personalized Z plates from years past and present. Note: The "^" carat prefix denotes a link leading to an external site. 350ZR» All material © Jeremy McCreary unless otherwise credited. Comments and corrections to 350zr@cliffshade.com.